Two things inevitably happen every winter: Starbucks unleashes a slew of holiday-themed drinks at their trillions of coffeeshops, and your grandma gives you a gift that both confuses and saddens you. “Oh wow, a sheet of laminated Buffalo nickels… thanks, grandma!” Starbucks holiday drinks, unlike grandma’s gifts, are a reliable source of happiness this holiday season, so we’ve tasted all seven and ranked ‘em, and now we’re giving you the best bang for your holiday buck. And don’t forget to tip your barista, even if you have to use Buffalo nickels. Oh, and while you can order all of these drinks hot, iced, or as Frappuccinos (Peppermint Mocha, Toasted White Chocolate Mocha, Caramel Brulée Latte, Chestnut Praline Latte, Gingerbread Latte and Eggnog Latte), we didn’t. These were all tasted hot in order to drink it as Starbucks originally intended. We didn’t modify them in any way, and the nutritional info included below is based on a 16-ounce Grande size. Without further ado, let us wrap ourselves in tinsel and commence sipping on holiday drinks! Perhaps I'm not an eggnog latte person, but the smell coming from it really turned me off. And the taste didn't do it any favors either -- sadly, it was a little like spoiled milk. 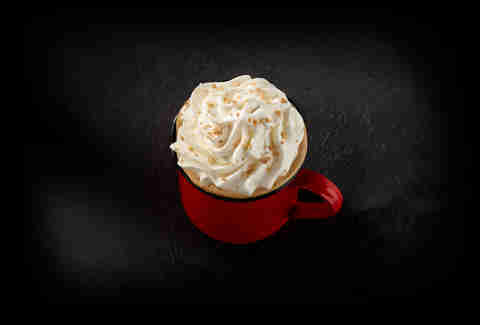 Also, unless Starbucks is planning on spiking their eggnog latte, what's the point of this? Give me bourbon in eggnog or give me death! Raise your hand if you like candied cranberry sugar in your coffee! Last year, it was sprinkled atop every white chocolate mocha, but this year it’s all about holiday sugar sparkles with with crispy white pearls. Those pearls are actually rice cereal, and they’re as crunchy as advertised. 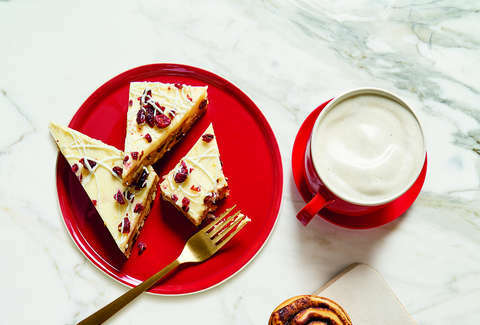 I love the look of the reddish sugar sparkles, and this year's drink thankfully does away with the cranberry nonsense and focuses on the white chocolate and coffee flavors in the drink. Much improved over last year. 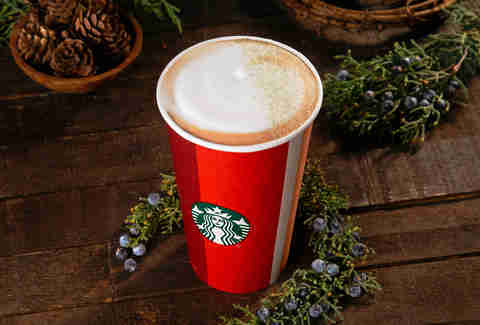 The divisive holiday drink smells like coffee with a hint of pine, like your car after you hung an air freshener in it and left a half-full cup of Starbucks there overnight. 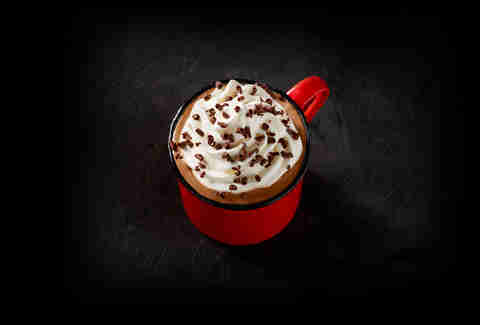 Many Starbucks drinks purposely mask the coffee with sugar, but this one is coffee-forward. It doesn't taste like anything other than a latte until the finish, which is slightly piney. It's hard to believe I'm writing this about Starbucks, but it's too subtle. The rest of the holiday drinks aren't afraid to taste like what it is, whether it be a Peppermint Mocha or a Gingerbread Latte. The Juniper Latte is your coworker sitting in the corner at the holiday party, refusing to dance. 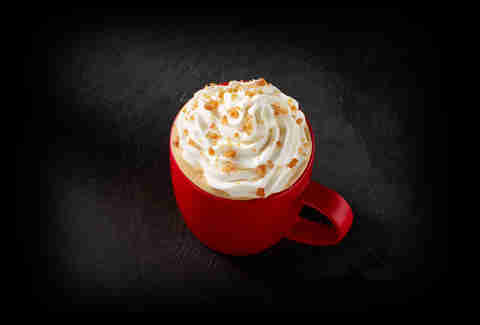 Loosen up, Juniper Latte, it's the holidays! This actually has a lot stronger coffee flavors than I would've expected from the 'Bucks, which typically lets any caramel drink go way overboard on the caramel flavors. The caramel and coffee play nice together here, and the finish does bring to mind a brulée. I was shocked by this one. They nailed the chestnut flavor here, and the finish is a little bit of the almond flavor hinted at by the praline part of the drink's name. A little saccharine in the finish, which deducts it a few points. I would enjoy roasting this drink on an open flame, but not in a bad way! Yes. Yes. Yes. 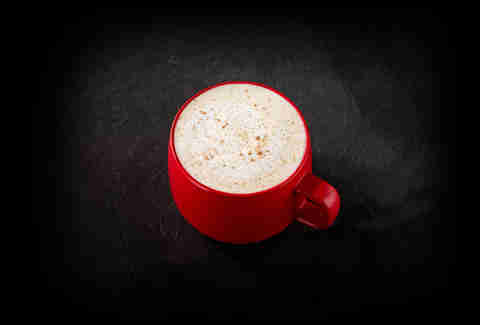 Considering how the uber-holidayesque Eggnog latte went over, I was fully expecting to not like the gingerbread. But this sucker finishes strong with cinnamon and ginger notes that make me feel like they blended up a gingerbread man and served him to me over coffee. Poor guy! The first sip is chocolate and cream, and the finish is a delightful chocolate and mint. And it doesn't leave an overly sweet taste in your mouth that makes you want to drink a gallon of water to wash it away. 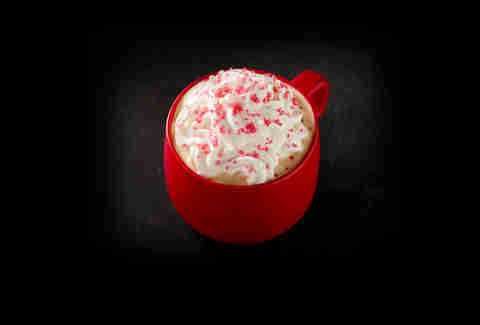 But is there a more holiday appropriate drink than the Peppermint Mocha? Even the name makes me want to fly a life-size candy cane across the sky on Christmas Eve, waving at Santa as he makes his deliveries, and flashing a thumbs up to his reindeer for working so hard. Starbucks makes getting into the holiday spirit even easier this year with bright-red reusable cups and four new designs that each look like wrapped gifts. 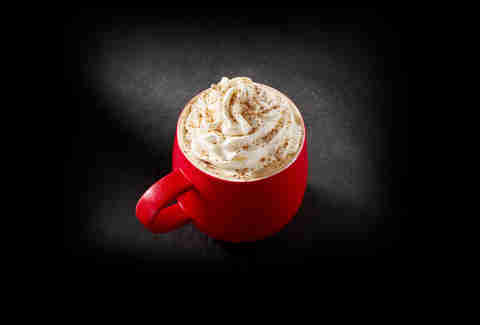 The Peppermint Mocha drink reps the holiday season way, way more than a Snickerdoodle Hot Chocolate ever could. It’s a seasonal classic, it’s delicious, and we bet you’ll crave one when it starts snowing outside on a cold December morning. Lee Breslouer writes about food and drink, and is strangely not as sick of coffee as you'd think. Follow him to Starbucks Rewards stars: @LeeBreslouer.